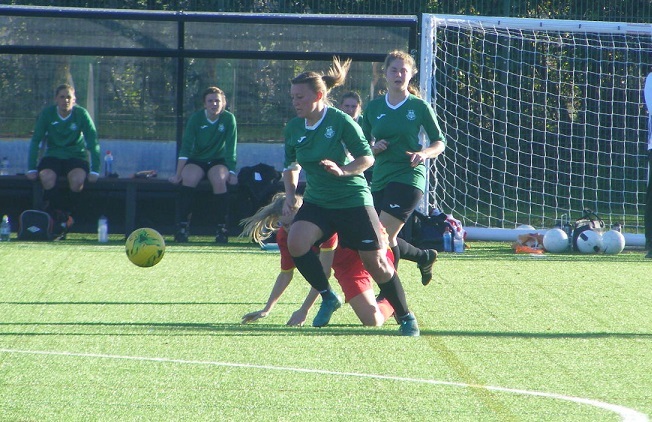 Two ties to begin this season’s Suffolk Women’s County Cup competition, holders Ipswich Town Women drawn away to fellow Ipswich side Wanderers Ladies in the 1st Round. Met in the semi-finals of the competition last season Ipswich Town comfortable winners 7-0. A different story this time around Ipswich Wanderers holding their higher league to a goalless draw at half-time. Ipswich Wanderers taking the lead on the hour with Kristie Turner on target to put the hosts 1-0 up. Into the final 15 minutes and Ipswich Town came back to level the score Toni-Anne Wayne scoring the goal. Wayne combining with Harriet Petley to score again in the 80th to put Ipswich Town 2-1 up Danni Clarke making a late save for the visitors to stop Ipswich Wanderers from levelling the score the holders through to the 2nd Round. Also competing in the 1st Round of the Suffolk Women’s County Cup were Walsham Le Willows Ladies at home to Beccles Town Ladies. The hosts getting off to a flyer taking the lead in the opening minute. Adding a 2nd goal were leading 2-0 with 30 minutes left. Beccles coming good at the end scoring 5 goals in 22 minutes to go on to win the tie 5-2 to progress. Taylor Whiting hitting a brace their were first goals of the season too for Eva Evans, Victoria Ottey and Lauren Runnacles. Three matches played in the Suffolk Women’s Division on Sunday and it was to one of these Women’s Football East headed to watch. A top of the table clash with league newcomers Needham market Women top of the table with a 100% winning start taking on defending champions, East Bergholt United Ladies who were also defending a 100% winning start and yet to concede a goal. Played in 3G, Needham Market started the brighter hitting the post before taking the lead on 18 minutes, Francesca Rainbird getting on the end of a miscued shot from Lois Balfour inside the box to shoot past the keeper and score. East Bergholt growing into the game hitting the crossbar themselves, Needham market leading 1-0 at half-time. Close behind the leading trio are Alresford Colne Rangers the 4th placed side moving onto 13 points for the season after a home win against Brightlingsea Regent Ladies on Sunday. Paige Knight getting on the scoresheet for Brightlingsea. Jo Harvey with a brace for Alresford moves onto 6 for the season with Tiffany Reeves also on target with a goal just ahead of Harvey with 7 for the season. Alresford winning 3-1 now unbeaten in 5 with 4 wins after losing their opening fixture. A first point of the season for Brettvale secured at home to fellow newcomers Chantry Grasshoppers Ladies on Sunday. Kelly Hannington with both of the goals for Brettvale. Keira Hines and Lucy Robson both scoring for Chantry Grasshoppers the point lifting them a place up to 9th in the league table. This entry was posted in Suffolk Women's County Cup, Suffolk Women's Division, The Round-Up and tagged Suffolk Women's County Cup, Suffolk Women's Division, The Round-Up on October 24, 2018 by WFEast.